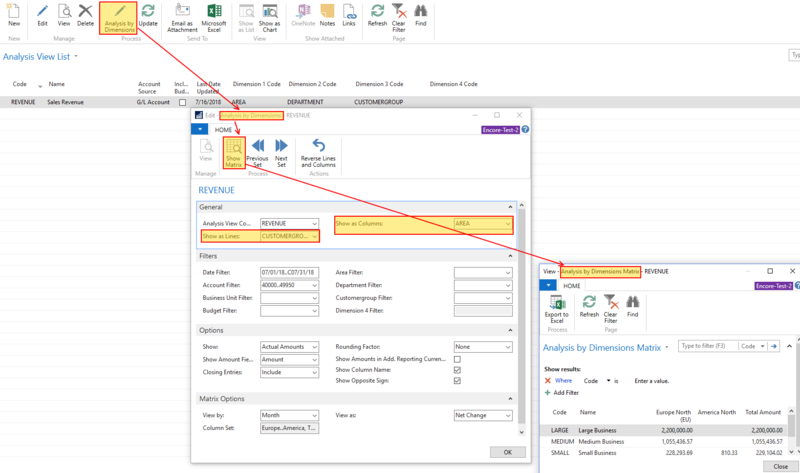 This post continues exploring the topic of Dimensions in Dynamics NAV (further, “NAV”) and Dynamics 365 Business Central (further, “D365BC”). Other posts have already discussed what Dimensions and Dimensions Values are; how to create; and assign them to Master Data and GL Accounts as well as how to block Dimension Combinations. This post focuses on how to use Dimensions in reporting in particular. Save your time in creating reports by combining Accounts Schedules with Column Layouts and Analysis Views. A detailed discussion of these tools is beyond the scope of this post as each tool requires a separate post to cover all the details; however, the points relevant to Dimensions are going to be highlighted here. The following section focuses on Account Schedules. Account Schedules are a tool that enables Users build their own reports. Typically these reports are based on the General Ledger (GL) Accounts (Rows) and are further broken down by month or period (Columns) that can be compared to the same period a year ago, for example or to the GL Budget for the given period of time. Account Schedules can be found in the Departments> Financial Management> General Ledger> Analysis & Reporting> Account Schedules in NAV OR under the “Finance” section in the Home Page Ribbon (“Accountant” Role) in D365BC OR by searching for “Account Schedules” in the Search Box in both D365BC and NAV. Default Column Layout – these are the columns of your reports which are typically your Accounting Periods, Net Changes, Balances and comparisons to the same Period a year ago or to the Budget. One of the limitations of Account Schedules is that they typically do not use Rows or Columns as Dimensions which can be useful, for example, in comparing how one of the departments contributed to the revenue of the company compared to another department. It is, however, still possible to do by filtering on each department and running Account Schedule Report twice, one time for each department. Screenshot 1: Account Schedule Report with “Department” Dimension Filter applied. As can be seen in Screenshot 1, it is only possible to filter the report by one of the Dimension Values, but the Row and Column titles do not change according to the Dimensions, only the amounts do. Another limitation of Account Schedules is that they only provide an opportunity to use up to two Global Dimensions. In order to be able to add more Dimensions and to make Dimensions (Dimension Values) as Rows and/or Columns, it is necessary to use Analysis Views Reports. The following section of this post focuses on this tool which is discussed in more details as they provide more flexibility in connection with Dimensions. Analysis View Reports are a reporting tool used to build financial reports in NAV and D365BC which allow analyzing data based on Global AND Shortcut Dimensions. Analysis Views can be found in the Departments>Administration>Application Setup>Financial Management>Dimensions>Analysis Views in NAV by searching for “Analysis Views” in the Search Box in both NAV and D365BC. 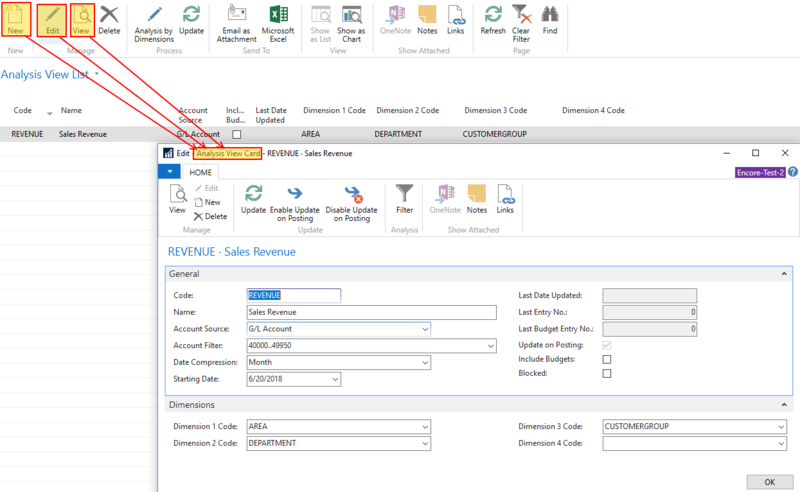 Dimension 1 (2, 3, 4) Code – these are the Dimensions that are going to be included in the Report and can be used as Rows or Columns. Global Dimensions must be included too if they are required for the analysis. Use the vertical bar symbol “|” between the Accounts you want to use to select several Accounts. Use two dots (..) between Account to set a range. It is useful keep Reports up-to-date by enabling the “Update on Posting” function. However, in companies where there are thousands of transactions happening frequently and dozens of Analysis Views Reports set up, it may be beneficial to disable this function to prevent the system from slowing down. This can be useful if a Budget with the same dimensions as the Analysis View has been created. Enabling this function ensures that only up-to-date information is used in comparing actuals to the Budget. If a company needs to run a Report based on more than four Dimensions (any number of Dimension Values can be used), which is rare, then the Report has to be run twice with a different set of Dimensions each time or to combine four Shortcut Dimensions in the Analysis View with the two Global Dimensions of an Account Schedule Report to be able to run a Report based on up to six Dimensions at the same time. 2. Analysis by Dimensions – this is the second constituent which is required to run an Analysis View Report and is accessed by clicking on the “Analysis by Dimensions” button in the Ribbon of the Analysis Views List; it provides further tools to design the Report and allows setting up filters to narrow down the results. As shown in Screenshot 3, an Analysis View Report can work well for building reports where it is important to be able to compare Dimension and Dimension Values against each other as shown above where revenue sources are compared by the “CUSTOMERGROUP” Dimension (“LARGE”, “MEDIUM”, “SMALL” Dimension Values) by the “AREA” Dimension (“Europe North” and “America North” Dimension Values). In conclusion it is worth mentioning that both Account Schedule and Analysis View Reports are easily exportable to Excel (and other formats). Importantly, Account Schedule Reports can be exported in two different formats out-of-the-box. Account Schedule Reports can be exported to a brand new Excel file or the fresh data can be exported to an existing Excel file. The latter is particularly helpful if Users want to create sophisticated Excel reports that use highlighting, different Excel formulas and other advantages while also keeping the data in the report up-to-date. Analysis Views, in turn, Export to an Excel file as a pivot table which may facilitate further processing of the data in Excel. The advantage of exporting Account Schedules and Analysis Views to Excel is that the file can be easily stored on a hard drive, shared internally in a convenient format or sent to external stakeholders who do not have access to NAV or D365BC. In summary, this post focused on how Dimensions can be used in reporting. Two major reporting tools have been discussed in this connection: Account Schedules and Analysis Views. Account Schedules can help with day-to-day reporting such as a trial balance repot, while Analysis Views allow more flexibility around reporting on Dimensions as they allow adding up to four Global or Shortcut Dimensions which can be shown as Rows, Columns or both. Both Account Schedules and Analysis Views can be easily exported to Excel for further formatting and sharing. At Encore, Solution Specialists help companies to set up and use Dimensions in the most efficient and effective way. The team of Solution Specialists at Encore are happy to answer your questions and to help you and your company reach your ERP goals – contact us anytime! This post was written by Iaroslav Pankovskyi, PhD.